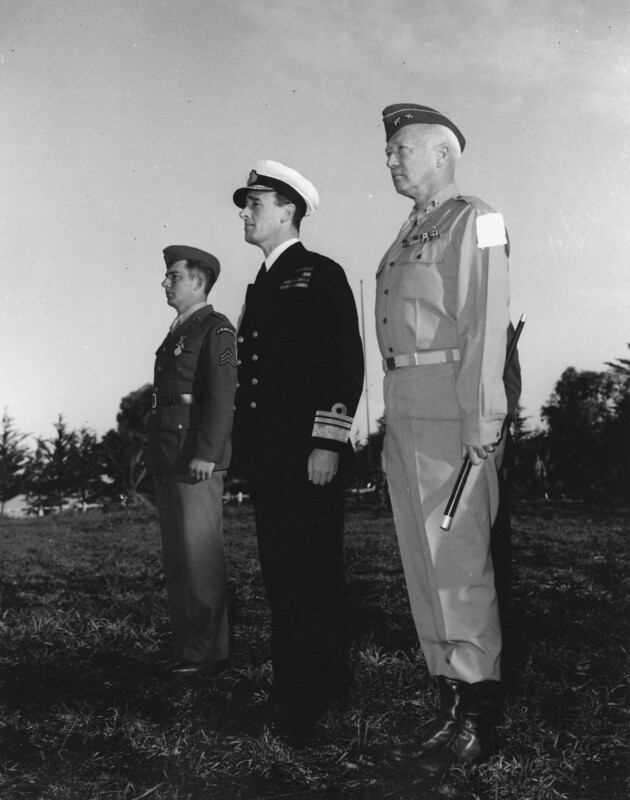 » Major General George Patton and Vice-Admiral Louis Mountbatten at Camp Anfa, near Casablanca, Morocco, 18 Jan 1943. Mountbatten had just presented Britain’s Military Medal to US Army Ranger Sergeant Franklin Koons. This photograph has been scaled down; full resolution photograph is available here (2,316 by 2,942 pixels). The Brit looks a gret deal like Mountbatten. By George, you’re right! I had originally ruled out Mountbatten due to my belief that Mountbatten’s rank was higher and he was primarily in China-Burma-India. It turns out both are incorrect. There is another more widely circulated photo of Patton speaking with Mountbatten that is clearly from this same event. The Casablanca Conference was taking place during that time and Mountbatten was Chief of Combined Operations for that conference. The caption here has been updated to reflect the information gathered from that photo’s caption. Thanks for the Comment! The army sergeant pictured is my uncle, Franklin ( Zip ) Koons. He is credited with killing the first German on European soil during the Dieppe Raid. To Anonymous (Comment #3): Thank you for this comment! Searching under your uncle’s name yielded much more information about this event and two more really good photos from the Library of Congress. One of those photos clearly shows the decoration to be the Military Medal which is awarded to enlisted personnel who demonstrate bravery in battle on land. The caption for that photo also confirmed that the decoration was for actions during the Raid on Dieppe, where Sgt Koons was one of 50 US Army Rangers who participated. Notice also that Patton’s unit patch has been removed by a censor. Cruiser USS Houston under tow by the USS Pawnee 17 Oct 1944 following Houston being torpedoed twice off Formosa (Taiwan) three days earlier. Note that Houston’s draft is 6-feet deeper than the maximum to be seaworthy.